Here's the thing: I struggle with the dichotomy of hipness when it comes to books and bookselling and the literary world. 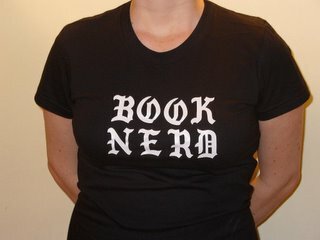 I've spent time in publishing (trade and college), literary agenting, book reviewing, and independent bookselling on both large and small scales, and I've been reading since before I could pronounce my "r"s, so I know a lot of books and authors and folks in the biz. I work now in a well-established bookstore in New York City, the throbbing center of the American publishing industry. I've gone to posh author dinners and shaken hands with big name authors and I know the buzz on books that will be published six months from now. So that makes me kind of hip, I guess, in my very small world. But I suffer from that killer of coolness, overenthusiasm. I am so crazy about literature that authors are my rock stars: I speculate about their lives, get all goofy when they're around, talk endlessly about their influences and comparative merits. I confound my coworkers with my desire to learn more, do more, take on extra jobs in the store because I just love doing it. I am so excited about bookselling, as the place where literature hits the streets, and as a possibility for the creation of community which is grounded in tradition but looking forward to the most exciting developments of a new age, that I bore even my bookseller friends. I do so much talking about this stuff that I finally realized I'd better start talking to more people. So here's the beginning. There are a wealth of fantastic literary blogs out there -- I'll link to some of my favorites. There are even some booksellers getting into the act. This will be a place to record cool experiences in the literary biz, to talk about books that I'm excited about, and to speculate and plan endlessly for my own bookstore, a goal that I'm working toward with embarassing giddiness. I hope some other book folks can read and share and enjoy. I'll probably keep right on chattering either way.